The NEHS chapter adviser is the primary facilitator of all chapter activities and is a key factor in determining a chapter’s success. Appointing a capable, dedicated individual for the job is one of the principal’s most important NEHS-related responsibilities. 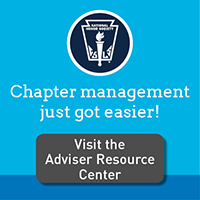 A good adviser is the key to the success of any chapter, so identifying a person with the necessary skills and commitment will ensure that all chapter members are served best. Principals may appoint co-advisers, i.e., more than one staff member to serve as the guides for all chapter activities. Changes in advisers should be reported to the national office (membership@nehs.org) any time a new adviser is appointed to serve. See the National Handbook for additional information.